T he St. Mary’s County Sheriff’s Office, in partnership with the St. Mary’s County Health Department, is now collecting personal medical sharps for safe disposal. 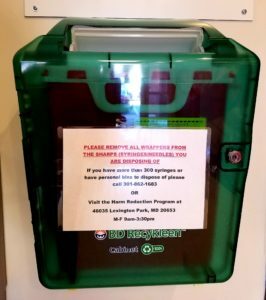 Community members may now safely dispose of medical sharps (such as syringes, lancets, and auto-injectors) as well as expired, unused and unwanted medications in the collection boxes that are available 24 hours a day, seven days a week in the front lobby of the St. Mary’s County Sheriff’s Office, located at 23150 Leonard Hall Drive in Leonardtown. Household sharps such as needles, lancets, and syringes used for self-administration of insulin and similar medications must be disposed of properly to prevent public health risk. If not properly secured, discarded needles may expose your family, pets and local sanitation workers or emergency responders to needle-stick injuries and potential infection. You can prevent injury, illness, and pollution by properly disposing of these materials. This entry was posted on February 5, 2019 at 2:15 pm and is filed under All News, Community, County, Law Enforcement, More News, St. Mary's News, z 600X120 Top Ad Bottom, z 600X120 Top Ad Top. You can follow any responses to this entry through the RSS 2.0 feed. be nice if they add one for crack viles too. I’d rather not put this on another story, but this concerns suicide and the criminal justice system. When someone kills themselves over the cjs, because they’re in jail, about to be taken into custody, or they’re a member of the cjs, an assessment should be made, a meeting should be held to determine the cause and it sholdn’t be a closed-door privileged meeting, which the cjs has plenty of, and they really have no business having. In addition to the press release, in addition to the next-of-kin notification, there should be a community discussion when something like this happens because of the cjs. Whats causing suicide, and how to stop it. Just like Portland and San Francisco!!! Make a way for it – and it will propagate faster. WOW.wondered why the reception was less than friendly at the Sheriffs dept Saturday. Couldn’t get the box open for the “sharps” . But let me ask this. Being a Diabetic where do I get rid of the sharps I use to inject Insulin ?? Sharps — is an arrow sharp? Yes. Does cupid still use bows and arrows in this day and age? well, of course. Is cupid going to be going around this week/ this month shooting people? I have no idea. Is anything other than a bow and arrow acceptable? No. We don’t have to discuss the shortcomings of males right now, do we? Well, of course not. Happy Valentines. Same to you.